Super lightweight goggles, no extra burden on head, frameless design provide unobstructed viewing, and impact PC lens, 100% UV400 protection, which ensures you guys a free and pleasing skiing and any snow sports experience. 100% UV400 protection: Strengthening treatment and coated lens more protective so as to protect your eyes from reflected glare light. Clear Viewing: 20%-25% VLT and frameless design provide unobstructed and clear viewing skiing experience. OTG: Fit over the glasses for those who need to wear eyeglasses. Adjustable & Fitting: Two layer of sponge and one layer fleece, absorbent and comfortable fit on your face to prevent the inlet, and adjust the elastic strap to fit on your head. 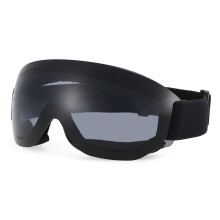 Ultralight : No frame goggles super lightweight(only 1.6oz) add no weight on your face so you can equip yourself with warmer wearing or a helmet. Note: Only the silver lens have silver-plated, but all the goggles are UV400 protection.